As you surely know, France has a long and troubled relationship -- certainly at a low point right now -- with Muslim/Arabic/North African cultures. But the one thing that is undisputedly welcome in France is the kebab. Not to be confused with the shish kebab, what we Anglophones call our skewered and grilled meats. The French kebab, is more like a Middle Eastern shawarma, and is based on one particular kind of Turkish kebab, the döner kebab. This is the fast food that the French fancy, fanatically. The kebab is a big hunk of layers of meat and fat -- usually lamb, chicken, or beef -- grilled on a big spit, then shaved down into slivers. Here's the döner kebab in action in Turkey. It's clearly the specific kind of kebab that all of France's kebabs are modeled after. Once shaved, the meat is placed with onions and a few token veggies in a wrapper. The proper accompaniment to a kebab is, of course, the French fry. We are in France, after all. And it's fast food. You can see in the above sign that other French fast food (and festival food) options include "All sorts of Americans." I'm assuming they mean they serve all sorts of American fast foods, like hot dogs or hamburgers, but really it's very unclear. And then, in huge letters, the granddaddy of all French barbecue options: merguez. Merguez is a very red-colored, sort-of-spicy (by French standards) sausage made of beef and lamb and which comes from -- you guessed it -- the North African Magreb. If anybody's counting, that means pretty much all of France's barbecue and fast-food options are foreign: burgers, hot dogs, merguez, kebab, and the occasional pizza. Since France is, both traditionally and still currently, the land of the two-hour meal, perhaps that makes some sense. To be honest, nobody in my family loves the kebab. Or the merguez. Or the hot dog, for that matter. But we loved the other kinds of kebabs when we were in Turkey, such as a delicious barbecued shish kebab. 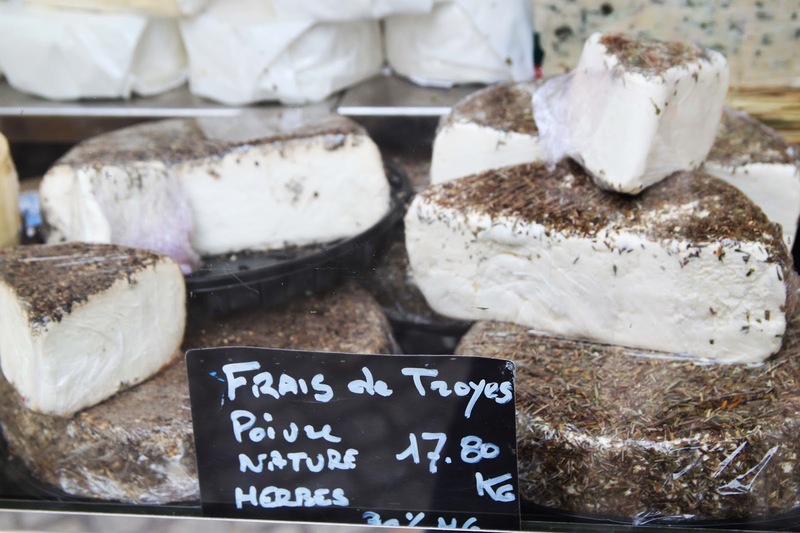 Frais de Troyes, which means "Fresh from Troyes" is, as you might have guessed, a fresh cheese, from Troyes. That's Troyes, France, out in the Alsace-Champagne-Ardenne-Lorraine region, not Troie (spelled Troy in English) in the country of Turkey. It's a tangy, light goat cheese made from raw milk and comes in many varieties -- plain, pepper, and herbs. As you can see, I spring for a wedge with herbs. It's wetter than cream cheese, and with a lovely tang that's almost like a yogurt. It's great spread on some bread and practically begs for a drizzle of honey, or jam, even with the herbed version. The most famous Troy, or Troie as they write it in French, is in Turkey, home of the truly fabulous shish kebab. On the other hand, kebab (but not shish) is mostly found in France, just where you can find a delicious Frais de Troyes. But I don't recommend eating them together. I love doner and shawarma and that cheese looks and sounds delicious. My stomach is growling now.